Lorenzo Sansone is known to many horn players for his publications and his innovative designs of equipment, especially the five-valve B-flat horn. He was also highly regarded as an orchestral player and a teacher. Sansone was born in 1881 in Monte Sant'Angelo, Italy. Despite disapproval from his father, Sansone began playing flugelhorn in the town band at age 10. At 13, he was hired by a band in another town to play horn and also played in the town orchestra. Because no horn teachers lived in the area, he taught himself, and he was proud of this fact. In 1903, Sansone emigrated to the US and started playing in the Chiafferelli Italian Band. After three years, he became conductor of the Ventura (CA) City Band. He arranged, edited, and composed music for that band and taught various instruments in Oxnard CA. Sansone's orchestral career included virtually all the major orchestras in the US in the first half of the 20th century (some now defunct); Los Angeles Symphony, Denver Symphony (1909-1910), St. Paul Symphony (1910-1911), St. Louis Symphony (1912-1915), Chicago Symphony (1914 summer), Cincinnati Symphony (1915-1918), Detroit Symphony (1918-1919), New York Symphony (1920-1922), Beethoven Symphony (1927), National Broadcasting Orchestra (1929), Metropolitan Opera (1931-1933). Sansone was on the faculty of Juilliard School from 1921 to 1946, where he taught nearly 300 students. He also taught privately at his shop and later at his home. He often said, "You are your own best teacher." He taught primarily from method books and stressed learning transposition by clefs rather than intervals. He often played for his students to illustrate his ideas. Sansone published etudes, two method books, editions of standard repertoire, and French Horn Music Literature with Composers' Biographical Sketches. Southern Music took over his publications. He published a series of articles in The International Musician in the early 1940s. 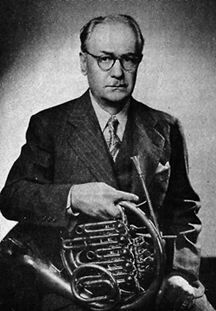 Sansone played a Kruspe double horn for 11 years but switched to a five-valve B-flat horn in 1914, while he was playing in St. Louis, and stayed with the B-flat horn for the remainder of his career. The horns were manufactured to Sansone's specifications by Wunderlich in Chicago from 1914, by Kruspe from 1916, and finally, from 1954, by Sansone at his shop, Sansone Musical Instruments, in New York City. The shop was established in 1925, with most of the business in publications in the early years. After 1954 he manufactured the five-valve B-flat horn, other brass and wind instruments, mouthpieces (metal and Lucite), woodwind reed tools, and mutes. His son Lawrence, who was also a professional horn player, eventually took over the business. Sansone was elected an IHS Honorary Member in 1971. A tribute appears in the November 1975 issue of The Horn Call and an article on his life and accomplishments in the February 2005 issue.